To access a vessels Documents folder go to 'Document Management' - 'Vessel Mandatory Documents'. This will load up the entire document structure with the Vessel Mandatory Documents pre selected. Pro Tip: You can actually click on any menu item under Document Management (except Vessel Mandatory Document Audit) to get to the entire Document structure. Whichever menu item you choose will be pre selected when the page loads. This is particularly useful if you want to look at a particular type of document. Vessel Mandatory Documents (VMD's) are documents that have been defined by your company administrator as required for this vessel, such as a certificate of Registry. This list may differ between vessels in your fleet. 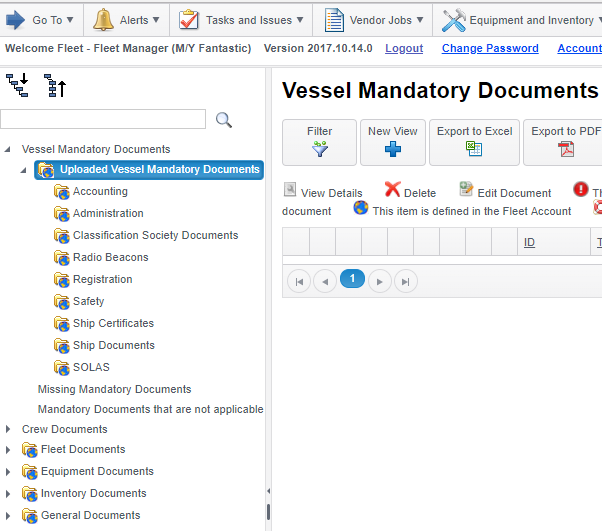 To view all of the uploaded VMD's for this vessel click on the 'Uploaded Vessel Mandatory Documents' folder and then click 'Show all items in subfolders' at the top of this page. This will give you a list of all VMD's sorted by title. Pro Tip: If you have a document that is not applicable to your vessel you can click 'not applicable' instead of add document. This will remove the missing alert and move the document into the 'not applicable' folder on the left hand side. Please note this will only make the document n/a to the vessel you are in, not the entire fleet. Once you have clicked 'Add Document' you will be able to upload a copy of the document and enter a date of issue, expiration and survey due date (if applicable). Entering the correct expiration and survey date is critical as any alerts will come from these dates! Once you have entered the information click 'Submit and Check In'. Crew Documents are split into two categories, Crew Mandatory Documents (CMD's) and General Crew Documents. CMD's are treating in exactly the same way as VMD's, detailed above, and you can see all CMD's by clicking 'Uploaded Crew Mandatory Documents' and the 'show items in subfolders' checkbox. This will show all CMD's that have been uploaded, grouped by crewmember. To add a document follow the steps shown in Vessel Mandatory Documents above. In addition to CMD's you can also add General Crew Documents to the system. General Crew Documents are documents in excess of the requirements set by your company administrator. 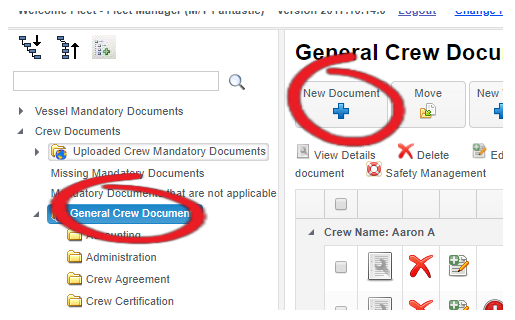 You can view all existing documents on the system by clicking the General Crew Documents folder and 'Show items in subfolders'. To add a general crew document click the 'New Document' button at the top of the page and follow the steps under Vessel Mandatory Documents. Fleet Documents are documents that have been created at the fleet level and assigned to particular vessels. At the vessel level you will only be able to view Fleet Documents. To do this go to the 'Fleet Documents' folder. As with all folders you have the option of viewing all Fleet Documents by clicking the 'Show items in subfolders' checkbox. You can also see the documents only within a particular folder by clicking it. You will then see a list of Documents in the centre of the page and will be able to download any attachments by clicking the blue hyperlinks. Equipment Documents, Inventory Documents & General Documents are all Document folders to hold vessel specific documents that are not marked as mandatory by your company administrator. They work in the same way as General Crew documents, so please follow the steps above to add new documents under this category.